The congregation at Rainsboro United Methodist Church has announced a new pastor. Israel Dotts began preaching on June 28 and services are at 9:30 a.m. Dotts will also serve Marshall United Methodist Church, where services start at 11 a.m.
Dotts was born in the Hocking Hills region of Ohio on Nov. 3, 1971. In his early teens his family moved back to northwestern Ohio where his parents were from, but he never lost his love for southern Ohio. Dotts came to faith in Jesus Christ when he was 23 years old and began attending a small United Methodist church where he first felt the call into ministry. In 2004, Dotts answered the call to pastoral ministry and in 2005 began serving as a licensed local pastor at Kansas and St. Paul United Methodist churches, a two-point charge in northwestern Ohio. In 2010, he graduated from the University of Findlay with a bachelor’s degree in religious studies and a minor in psychology. In that same year Dotts was reappointed to the South Point UMC. Dotts graduated in May 2015 from Asbury Theological Seminary with his master’s of divinity degree and was commissioned as a provisional elder on track for ordination at this year’s West Ohio Annual Conference. 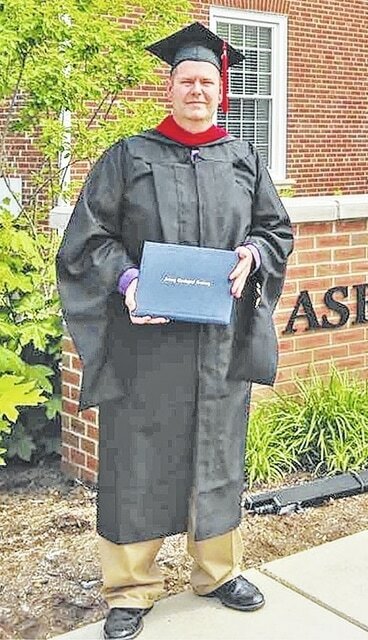 Dotts’ wife, Michelle, is currently pursuing her master’s degree in history at Marshall University. Kevin and Michelle have a son Dorion, who is align with his wife, Kaitlin, is expecting their first child in July. The Rainsboro United Methodist Church is located at 7579 SR 753, at the corners of U.S. Route 50 and SR 53 in Rainsboro. The Marshall United Methodist Church is located at 10968 SR 124 in Marshall.